A woman holds a cluster of U.S. flags during a U.S. Citizenship and Immigration Services naturalization ceremony in Oakland, California August 13, 2013. 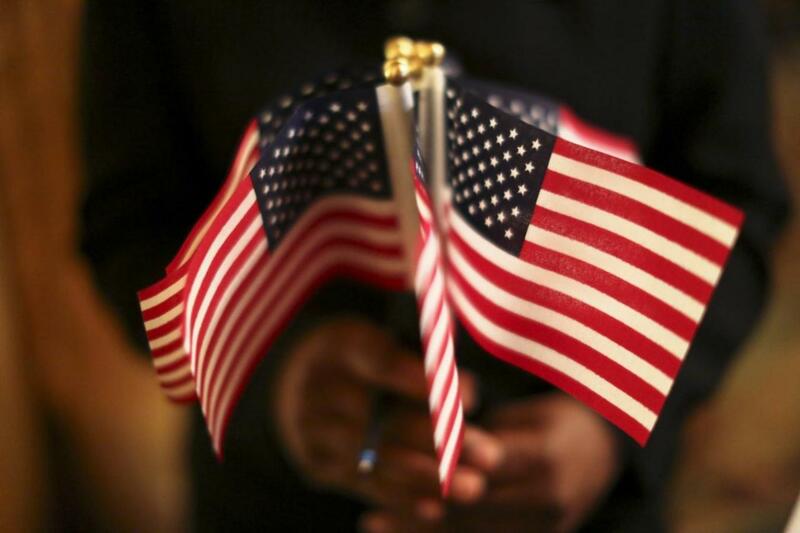 A total of 1,225 new citizens representing 96 countries took the oath. REUTERS/Robert Galbraith. I came to the United States in from India in 1991. A year later, as an oblivious eleven year old, I watched a young charismatic Governor of Arkansas rise to prominence and become the President of the country I called home. Eight years on, in 2000, as a precocious college student, I watched in amusement, as the empire struck back and George W. Bush became the leader of the free world. In 2008, as a first time voter, I participated in Barack Obama’s rise to prominence, and in 2016 I was amazed to see a rank outsider in Donald Trump sweep the nation and storm into the White House. similar platforms of change ( the motto for the Clinton Campaign in 1992 was For People, For a change while the Obama campaign pitched “Change we can believe in”). Donald Trump borrowed Ronald Regan’s 1980 slogan (“Lets Make America Great Again) and tweaked it by dropping the first word. Each election cycle also saw each party progressively move away from the political center adding fuel to populist movements on either side. The argument has been made that this is the will of the people and that America in more polarized than ever. But is it? Or is it that the loudest, most energetic and best funded voices on either side of the aisle are simply drowning out the voice of reason in the middle? A recent article on CNN.com highlighted that while almost half of the Democratic party identifies itself as moderate or conservative (51% see themselves are Liberal), there is pressure for candidates to move their political positions as far left as possible because “thats where the energy, activism, and money is coming from”. Again, the numbers support this idea as Bernie Sanders currently has almost 3 times the number of small dollar donors for his presidential campaign as his closest candidate. Sanders has over 2 million donors compared to 743,000 for Beto O’Rourke. No one else has over 350,000. Much like the Tea Party movement has done with the Republican party over the past decade, conservatives and moderates within the Democratic Party find themselves marginalized and demonized for not towing the line. As a result, there is almost a schizophrenic nature to the Blue half of American politics at the moment, with the buzz and energy screaming for greater focus on progressive ideals but the voice of the voters urging for a more moderate approach. Indeed, the 2018 mid-terms highlight as much for while much of the buzz around the “Blue wave” came from progressive candidates like AOC, 23 New Democrat Coalition backed candidates flipped House seats to help the party gain a majority. This meant numbers of the Blue Dog Coalition in Congress swelled from 18 to 27. Further, a Gallup poll from December 2018 indicates that 54% of Democratic voters want the party to be more moderate. Yet a quick look at the 2020 primary race shows a long list of left leaning candidates who continue to garner buzz, support and money. And there in lies the trap the Democratic Party must avoid. The activism and buzz around the progressive voices in the party is more a reaction from the party’s base to the current administration. This isn’t shared by the nation as a whole ( as the mid term elections demonstrate) and to lean into it would further continue a trend that marginalizes a large part of the nation’s voters. There is no denying that liberalism is on the rise in America. Polls show voters who identify themselves as liberals has increased from 17% in 1992, to 26% in 2017. Those gains have come mostly at the expense of moderates who have declined during that same period from 43% to 35%. That still means however, that a little over 1 in 3 Americans is a political moderate. Further, when broken out by age, 40% of those polled between the ages of 18 and 29 considered themselves as moderate. As such, the rise in liberalism has been felt much more within the Democratic party as compared with the nation as a whole. So if more than a third of Americans are still somewhere in the political center, is the country more polarized than ever? A 2014 poll conducted by Third wave (A Democratic think tank) revealed that moderates understand the complexity of the issues we face and appreciate the nuance required to address these problems. They also understand both sides of the debate and as such only a 1/3 would always vote based on party affiliation. The vast majority are open to voting for either party depending on the issues and the candidates they connect with. As such, the Democratic party’s decision to veer further left of the aisle would be a grave mistake. It is intuitive to be seduced into the thinking that a rightward shift from the Republican party should elicit a similar shift left for the Democrats. But doing so will only further polarize discourse and alienate the massive moderate swing vote currently up for grabs. Political moderates are looking for a home. Driven out of the Republican party by the Tea Party movement, they are increasingly disenchanted by strict adherence to ideology from either party. Its time American politics took notice!